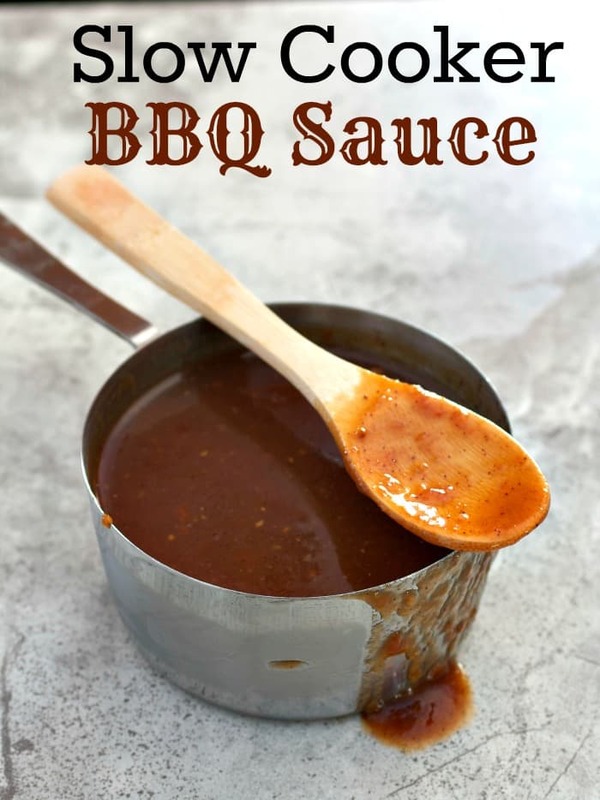 A family recipe adapted for the crock-pot, so break out the barbecue grill this weekend with this Easy BBQ Sauce recipe. A delicious Southern sweet and tangy sauce, so easy to make that you’ll never use the store bought bottled sauce ever again! If you follow me on Instagram or Facebook, you know I’ve been all about grillin’, smokin’, and chillin’ as much as posisble. I love barbecuing on my Pit Barrel Cooker, which is a refined version of a UDS smoker (Ugly Drum Smoker – the kind made out of a 55 gallon drum). This thing is great since you hang the meat over the coals and the fat drips on the fire creating the moisture and flavors of whatever you’re cooking. Also, due to the design it allows me smoke a shite ton of meat at the same time. All that smoked meat needs a lot of tasty sauce on top and it has to be homemade! Because no one should ever spend a half a day smoking meat, just to ruin it by coating it with a sauce in a bottle. I have fond memories of this family recipe. My Mom has been making it for as long as I can remember. Every time she made it, I would find myself following the delicious smell into the kitchen and peering into the tall stainless steel pot. I would take the wooden spoon, that was always next to the stove, and gently stir the thin sauce around the pot, being careful not to disrupt the floating lemon slices. The rich red color of this southern vinegar based sauce with the tangy smell, is a childhood memory I cherish to this day. I remember having the self-proclaimed title of “official taste tester” of the sauce and my duty was making sure the sauce was at it’s best. In fact, I took my job very seriously and I would continue to taste many times throughout the day. It’s a good thing my Mom always made such a large pot of this sauce because I probably ate 2 cups of it while exercising my official title. I still have a deep love for the spicy, has a thinner consistency than the the apple cider vinegar and lemons. To make the cooking process even a little easier, I adapted the recipe to cook in a crock-pot or slow cooker. Just set it and forget about it! And the leftover sauce will stay fresh in the refrigerator for months or, if you’re really handy, can the sauce in glass jars and they’ll keep in the pantry indefinitely. I always like having a jar of this barbecue sauce in the refrigerator, because my whole family LOVES using it on all sorts of foods, like these poppers and this smoked porchetta recipe. So go on make a big batch of Slow Cooker BBQ Sauce and get yo grill on this weekend!! 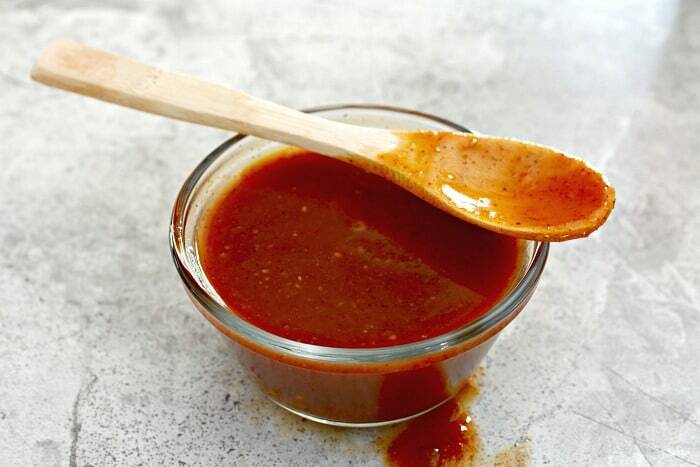 Happy grilling and don’t forget to share this easy BBQ sauce recipe with your friends and family! PIN it for later and make a batch to give out as gifts too. 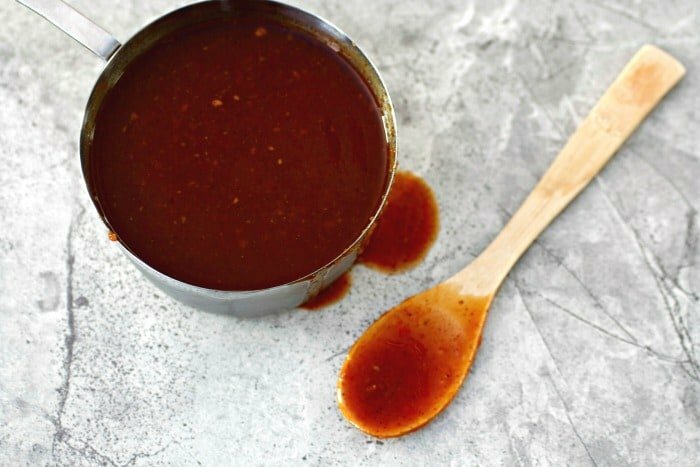 A family recipe adapted for the crock-pot, so break out the barbecue grill this weekend with this Homemade BBQ Sauce recipe. Combine all ingredients in a crock-pot or slow cooker. Cook on high for 3 hours, then reduce to low and cook for additional 2 hours. Remove lemon slices and allow to cool before storing in the refrigerator. Can use an immersion hand blender to smooth out the sauce, if desired. Leftovers will stay fresh in the refrigerator for months or, if you’re really handy, can the sauce in glass jars and they’ll keep in the pantry indefinitely! Originally published July 2016, updated with additional information and tips. That Pit Barrel Smoker sounds awesome, Karrie! I bet you’re gonna get a lot of use out of that one! Will you also use in it in the Winter month’s? Hubby & I bbq all through the year. He goes out on the deck with a big jacket and cap on despite the snow, lol. So awesome that this is a recipe adapted from your Mom’s! Those are always the tastiest recipes. I’d say that you were the best official taste tester That’s the best job in the world, isn’t it? Is this low sodium? Lol? Nice work Special K! i was looking for a good home made BBQ Sauce. May need to fire up the Treager Sunday now. Making this in the crock pot is such a great idea! We are going to have to change your name to Smokey Ever After! Have fun with your new smoker! Brilliant! 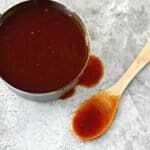 Homemade BBQ sauce is the best – and now you’ve managed to make it even better! Slow cooked?! My boys (and I, of course!!) will love this!! Pinned! Happy weekend, my friend! What you talking about ANOTHER new smoker? Jimminy! How many do you have and when are you inviting me to a meat fest? And I don’t want no user error on my ribs and I’ll be needing at least 15 cups of that bbq sauce! Hi Karrie I love the memories of cooking, and loved yours and the part about tasting it.It was the same story in our house except not barbecue sauce, tomato sauce. I lived that you adapted it to the slow cooker. Love that appliance I call it the plop and go. Great looking barbecue sauce and at a glance of the ingredients it sounds like tge grill is on!. This bbq sauce sounds so good!! Love that you made it in a crock pot! This looks so good. I want to put this barbecue sauce on everything. I think it’s really cool when people make homemade sauces like this. Karrie, I bet you were the BEST “official taste tester” EVER Love that you adapted your mom’s recipe to make this amazing sauce! I feel like I can just maybe dip a fry or two in this sauce, then just finish off the entire bucket. Just cuz. Here’s to tons more awesome cookouts with your UDS this rest of this summer! Pinning, of course! What a brilliant share, Karrie! Homemade sauces are the best, and this slow cooker BBQ sounds so wonderful and looks even better. Love the fact that you have adopted your Mom’s recipe. You are just too cool for school, girl! Making your bbq sauce!! Seriously, this is way cool. Love it! I love homemade sauces and this one looks so perfect and flavorful. I want to make this one soon and use it in my recipes. Thank you so much for sharing this! I am wildly impressed! this looks so delicious- i feel like making different sauces is the best way to switch up my usual dinners. Love that I can use my crock pot! Well now, doesn’t this look sticky sticky good! I like the look of this sauce. And I think it likes the look of me too! I haven’t made my own BBQ sauce in years. This looks pretty straightforward, and the slow cooker makes it just that much easier. Those childhood memories are worth more than gold. Yours is so sweet! This sounds like a killer sauce, Karrie! I’m making it for my summer grilling!! I do this thing where I dip potato chips in BBQ sauce and call it dinner. It’s THE BEST! But I always use bottled sauce. I’m totally going fancy and making your sauce soon, because when you’re a girl who eats potato chips for dinner, being gourmet is very important :). Seriously, this sounds like one heckuva good BBQ sauce! OMG, my mouth is watering thinking about your smoker! I inherited a smoker grill thingy and I haven’t used it. Mostly because I’m intimidated since I don’t have experience smoking meat. I’ll have to private message you when I’m about to try it for the first time, so I can get as many pointers as possible! Your BBQ sounds so freaking delicious. I’ve never cooked homemade BBQ sauce with lemons before but it sounds amazing! Pinning! The official taste tester…that is a nice job. Your sauce sounds wonderful…I like it that it is not too sweet. Thrilled I opened this link because THIS IS SO SOMETHING Landon and I could make for our big BBQ party we are hosting next week!!! Could you alter this to be made in the instant pot to cut the cooking time? Hi Christy, I’ve never tired cooking it in an instant pot, so not sure if it would work or not. I’ll have to try it and republish it as an Instant Pot recipe!